The Jack A. Hruby Natatorium features a 25 yard indoor pool with a one-meter diving board, an adjacent whirlpool, and a series of glass doors that overlook and access the outdoor leisure pool. The skylights, wooden beams, and tropical palm trees give the area a warm feeling all year round. The outdoor leisure pool has a mushroom spray feature and a zero grade entry that steps down to four feet at its deepest point. Any person wishing to use the Therapy Pool must have a Self Directed Therapy Verification Form signed by your doctor and have it on file. Show More...No diving is permitted anywhere in the Therapy Pool. Anyone needing assistance entering or exiting the pool must provide an aide or family member to assist them. Staff members are not permitted to assist patrons with transfers. Staff members will be available to help with the use of the lift and/or ramps. Any person with an obvious wound will not be permitted to use the Therapy Pool. No person who is observed passing feces, urine, or blood into the Therapy Pool shall be permitted to use the pool. Any person who has been refused entry to or removed from the Therapy Pool because of a wound may be granted entry upon presentation of a written statement from a physician that the condition is not infectious. Prolonged exposure or excessive strenuous activity may result in nausea, dizziness, or fainting. Alert a lifeguard immediately if you are experiencing any of these conditions. Patrons must wear appropriate swim wear. The Therapy Pool will close for at least 30 minutes in the event of thunder and/or lightning. Patrons are not permitted to hang on steps, lane lines, or safety lines. Please use the handrails along the pool walls. Glass and other sharp objects are not permitted. No food is permitted on the pool deck. Patrons should enter and exit through the Therapy Pool Locker Rooms. 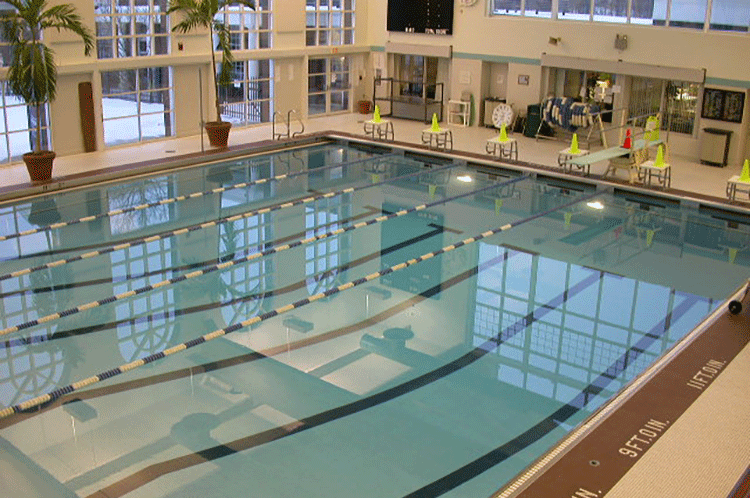 Seating for observers is located in the hallway or Activity Room F adjacent to the Therapy Pool when Activity Room F is not otherwise occupied. 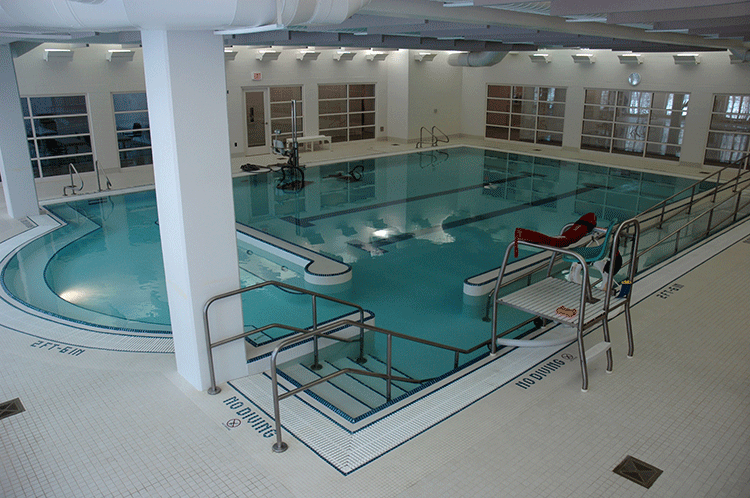 Equipment located in the Therapy Pool must be assigned, monitored, and/or supervised by a lifeguard or physical therapist. Cardio strength aquatics was developed to provide a whole body workout at any fitness level. Intervals of cardio combinations and strength toning exercises will provide you with a head to toe workout. This workout uses the resistance of the water along with barbells, noodles, jogging belts and resistance bands to obtain an effective cardiovascular and strength building workout without added stress on your joints. The Arthritis Class is a recreational exercise program developed by the Arthritis Foundation to help individuals with Arthritis and other related conditions. The activities and exercises are designed to encourage self care, social interaction, improve muscle strength and flexibility. Each participant works at his or her own fitness level. Modifications are given for each exercise to help individuals customize the program to fit their needs. This program is an excellent post therapy class or post surgery class as it focuses on muscle strengthening and flexibility. The Liquid Strength program is to provide participants with water resistance training. Participants will spend 60 minutes working in the water on range of motion activities and resistance training. This class is open to individuals of all ages and varying abilities especially those with mobility impairments. The Water Exercise with Nora class begins with warm up exercises to get participants acclimated to the water then moves to a more vigorous segment of exercises to work the large muscle groups. Toning exercises and resistance stretches are varied from class to class to keep the exercises fresh and invigorating. The goal is to increase participants’ muscle tone, cardio benefits, and to help them achieve their personal health goals. Please call to confirm starting date. Sculpt and Splash is a 50 minute class for people of all fitness levels. The participants will use a variety of equipment (noodles, weights, bands etc.) and focus on cardio endurance, muscle strengthening and resistance training, challenging their muscles in new and fun ways. A low impact class to develop flexibility, breathing, balance, and core strength. Full body workout for all fitness levels, consisting of stretching, strengthening, balancing and core work. Pool noodles, water weights, and bands will be used for added resistance. A very effective class that is also easy on the joints. No mat or yoga experience necessary.